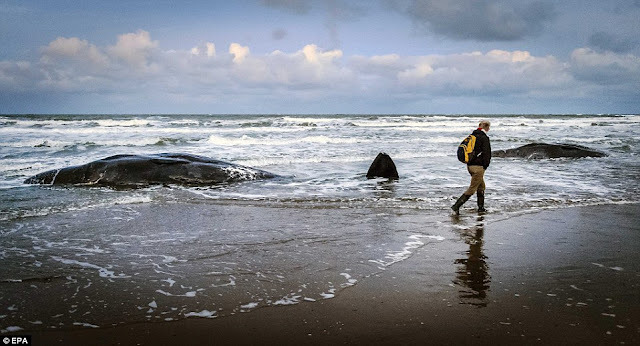 Deafwhale Society's earthquake stranding theory explains blue whale beaching! The beached blue whale in this video was found at Failaka Island off the coast of Kuwait. It was between 15 to 20 meters long. Blue whales are known to be the largest mammals on earth sometimes exceeding 30 meters long. Kuwait Environment Protection Society director Wijdan Al-Eqab said that blue whales roam many areas in the world including the Indian Ocean from which the beached one at Failaka Island most probably came. She also guessed that the whale had likely lost its way and was carried off by swift currents to the Arabian Gulf. No reason for its death has been determined as of yet, she said. Blue whales have been spotted in February in the Arabian Sea. 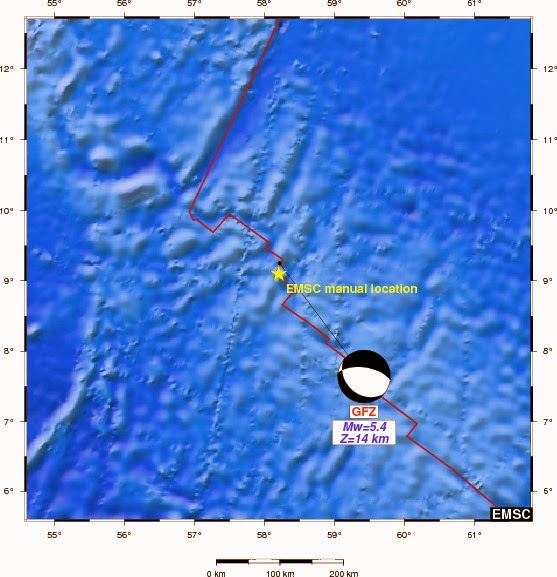 The only undersea earthquake that could have injured this whale occurred in the Arabian Sea about 2,000 miles upstream from Kuwait at 11 pm at night. It was extremely shallow (3 km) and very whale dangerous. The general flow of the surface currents in February was from the epicenter at the lower left of the above chart towards the Gulf of Oman at the upper left and then into the Persian Gulf. Blue whales can swim up to 20 mph if excited. This whale would have easily traveled downstream 150 miles per day, arriving near Kuwait at the end of February in perfect time with this beaching. KUWAIT, March 1 (KUNA) -- The blue mammoth whale that has recently come ashore Kuwait's Failaka island is said to have perished due to swallowing up some robes that got stuck deep in the whale's mouth and are believed to have obstructed food intake. A team worked for four hours to extract samples and make measurements but the task was difficult due to the bad smell. It is my opinion that this whale got these ropes trapped in its mouth by trying to feed during the journey from the epicenter to the stranding beach.